John’s Dad was born in 1896 and survived the 1914-18 war. He married a 17 year old girl in 1926 and by 1928 they had two sons. John was born in 1942 when war was raging from North Africa to Moscow and in the Pacific from Japan to Australia. In 1941 Hitler had been expected to invade Britain and children were being evacuated to Canada and America. John’s birth was a deliberate act of defiance, a two fingers to Hitler, and a testament to his parents’ belief that goodness, if piled on thick, will eventually smother evil. That attitude of defiant goodness stayed with them until they died in 1976 and 1986 and had a most profound influence on John’s outlook on life. Because of the age difference between him and his brothers, John was brought up more or less as an only child. He went to school in Dunfermline, Cardenden and Cowdenbeath in Fife before becoming a student of Architecture at Edinburgh College of Art. In 1970 he married and moved to Edinburgh. He graduated in 1975 (ish) and joined the Architectural Practice he would retire from as Senior Partner after 30 years. His work included, electronic research and development buildings for the defence industries, schools, colleges, universities and hospitals for clients including Ferranti, GEC, Herriot Watt, Napier and Dundee Universities, Dunfermline, Victoria and Ninewells hospitals and the Imam University in Saudi Arabia. While building his career, John played golf and sailed dinghies but, in common with many other people, he could not find time to own and work with his first love, horses. All that changed on his retirement. 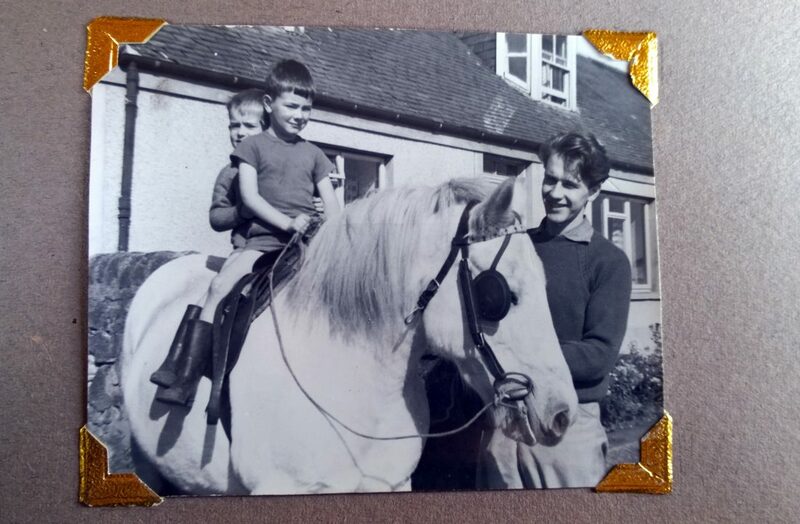 John’ s first pony was a West Highland – smaller and less rotund than to-day’s Highlands. Her name was Molly. John, when aged seventeen with little or no riding experience, collected her in Selkirk and rode her the 60 miles or so to Crossgates in Fife. She was kitted out in a cavalry saddle with wooden skids, iron hoops and a leather hammock seat. With hindsight, that journey set John out on the road to becoming a Western rider. He and the pony found an easy-going, comfortable way of travelling over hills, moorlands, on roads and over streams. The pony and he slept rough wherever cover could be found. Molly stayed with him for 7 years before John had to pursue his career in Architecture. That was over 50 years ago. The experiences lived during that first trail ride coloured his approach to horses and, for that matter, all animal life – how to treat them and how to be with them. John is now lucky enough to be able to enjoy the same kind of close relationships with his own Quarter Horses and finds that the Western way of being with horses, while a little more sophisticated than in those early days, is still a close match for what he experienced as a 17 year old travelling alone with his pony on that first trail ride.